Something BIG is coming to The Water Gardens! 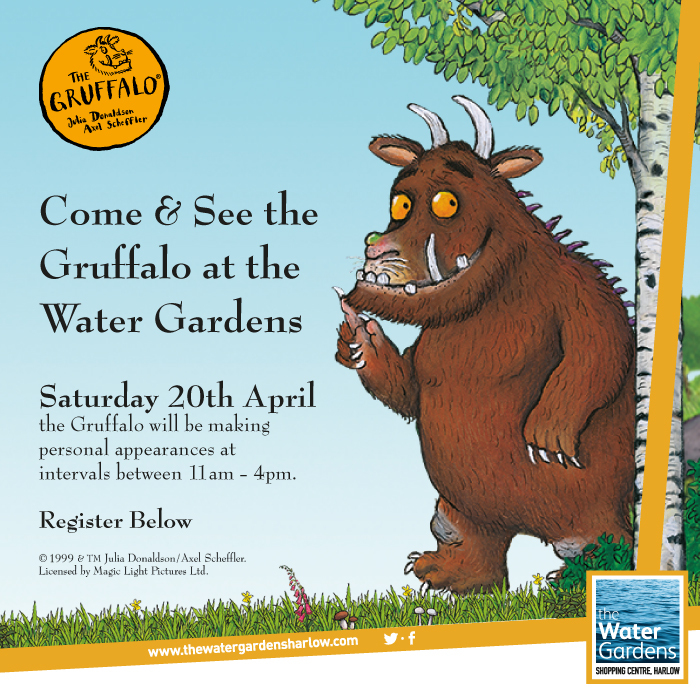 Register to meet the Gruffalo! His eyes are orange, his tongue is black; He has purple prickles all over his back...and you could be coming face to face with him this Easter at the Water Gardens! We are excited to announce that the Gruffalo himself will be gracing the shopping centre with his presence on Saturday 20th April. You’ll find him in the deep dark woods also known as the Gardens (at the Water Gardens) for a FREE event, with appearances at 11am; 12pm; 1.30pm; 2:30pm and 3:30pm. Please register below, once registered you will receive an email voucher (sent straight to your inbox) which you will need to show to take part in the meet and greet. Please note that the event is on a first-come-first-serve basis.